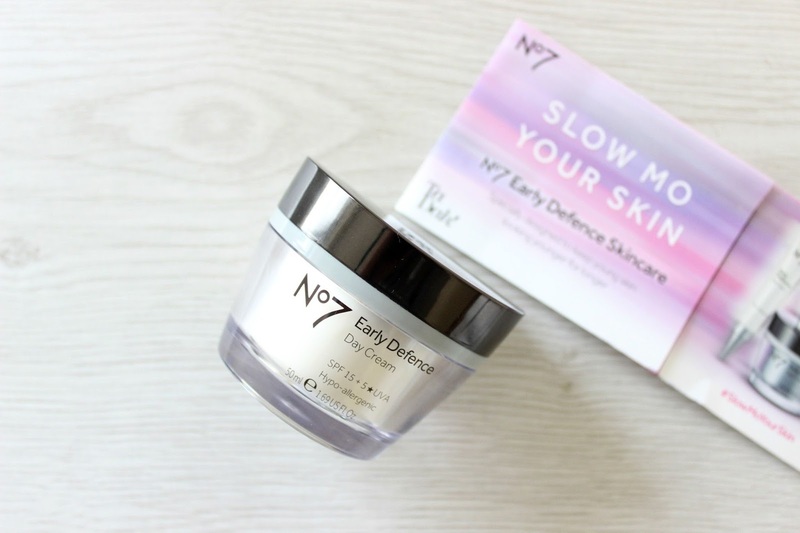 No7 recently launched a new line of skincare called Early Defence, targeted at younger skin types (20-30s), in an attempt to slow down the signs of ageing or as they put it 'slow mo your skin'. I was recently very kindly gifted their Early Defence Day Cream* from my local Boots (Middlesbrough), to see what I thought about the new range. The range consists of a Day Cream (£19.50), a Night Cream (£19.50) and an Eye Cream (£13.50). No7 Early Defence Skincare with unique Double Defence technology and superlight formulations is specially designed to keep young skin looking younger for longer. Every day your skin is exposed to environmental stresses like UV rays and pollution which can put a lot of pressure on your skin. Double Defence technology (patent pending) is a powerful blend of antioxidants which help protect your skin from environmental stresses. It also includes ingredients that help boost your skin's natural defences. The Early Defence Day Cream also has 5* UV Protection plus SPF 15, which is an added bonus. Firstly, the packaging is so sleek and expensive looking, with it's glass outer shell and shiny black lid. #sassy. The formula of this day cream is feather-light, which, usually I shy away from as my dry skin needs something a bit richer, but this is different. It gives my skin all the hydration it needs, whilst absorbing quickly, leaving a great base for makeup. Obviously, in terms of keeping my skin looking younger, I can't really comment on that yet, but I do think my skin feels plumper and I love being safe in the knowledge that my skin is being protected when I'm out and about. You can watch the #SlowMoYourSkin video here, and read more about the benefits of No7's new range. And if you're ever in or around Middlesbrough, make sure you pop into Boots, as the girls on the No7 counter are amazing and so helpful.